Here is yet another hilarious video for you. Honestly, is there no end to the funny stuff one can find on the internet? I really loved this dinner. 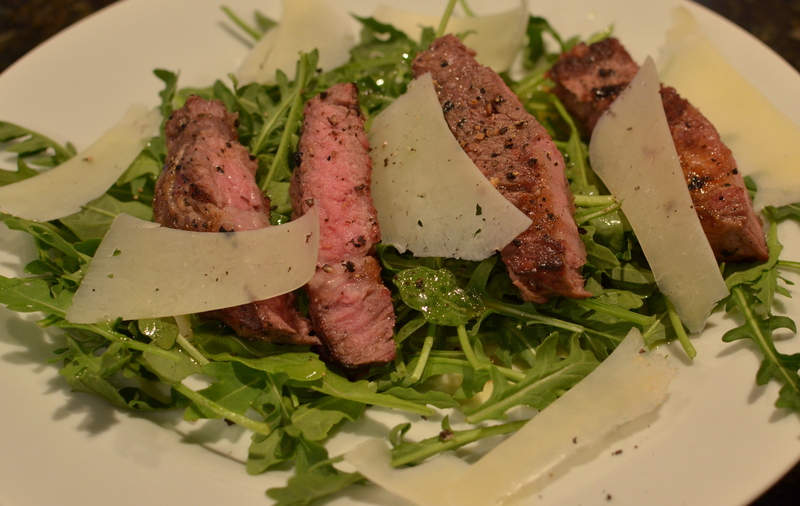 The steak is simply grilled, sliced and served atop a bed of lightly dressed, peppery arugula. 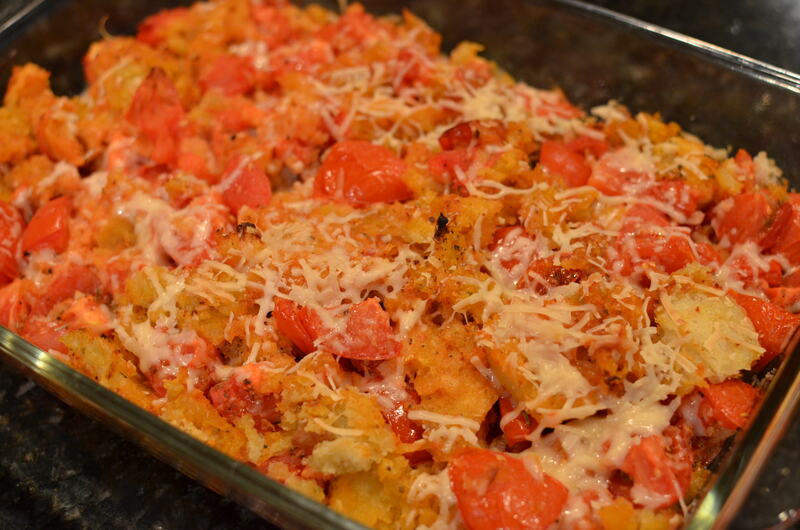 A meal in itself, but I wanted to try out the Scalloped Tomatoes in the same cookbook. 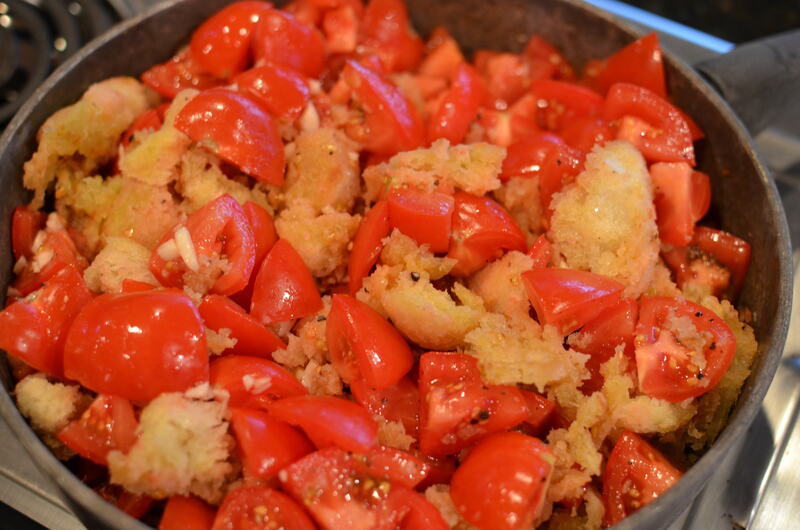 This tomato and bread casserole is bursting with flavor from the olive oil used for the sauté, some garlic, the basil and a liberal scattering of Parmesan cheese that gets all crisp while baking. Fantastic. 1. Prepare a charcoal grill with hot coals or turn a gas grill to medium-high heat. 2. Brush steaks lightly with olive oil and sprinkle both sides with salt and pepper. Set aside at room temperature for 15 minutes. 3. Meanwhile, whisk together 1/2 cup olive oil, lemon juice, mustard, 1 teaspoon salt, and 1/2 teaspoon freshly ground black pepper. Set aside. 4. When the grill is ready, place the steaks on the grill. Cook them for 5 minutes on each side and then close the lid making sure the vents are open slightly. Cook 5 to 15 minutes more for medium-rare or until the centers of the steaks register 125 degrees on an instant-read -thermometer. (Here I cooked the steak on my grill pan on the stove, medium high for 5 minutes on each side) Remove to a plate, cover tightly with foil, and allow to rest for 10 minutes before slicing thickly. 5. 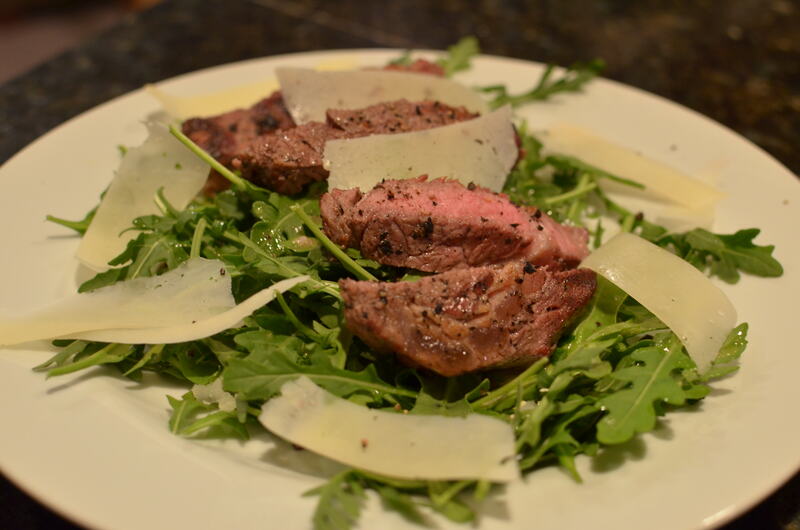 Toss the arugula in a large bowl with enough of the dressing to moisten; divide among 4 plates. Place a half a steak on top of each salad. 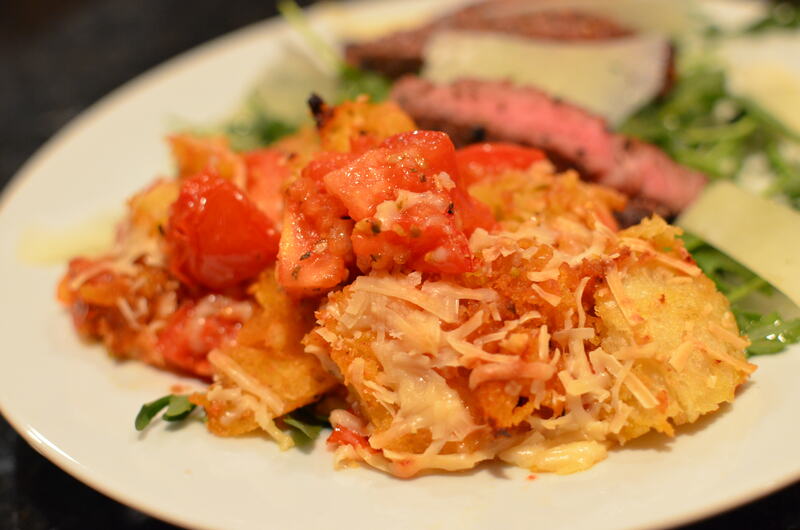 Shave the Parmesan onto each steak with a vegetable peeler, sprinkle with salt, and serve hot. 1. Preheat the oven to 350℉. 2. Heat 3 tablespoons of olive oil in a large (12 inch) sauté pan over medium heat. Add the bread cubes and stir to coat with the oil. Cook over medium to medium-high heat for 5 minutes, stirring often, until the cubes are evenly browned. We’re heading to Portugal for today’s music. I love this soft and soothing tune. Check out They’re Heading West on their Bandcamp Page, where you can also buy the music. This entry was posted in Beef, Main Courses, Salad, Side Dish, Vegetable and tagged They're Heading West. Bookmark the permalink. 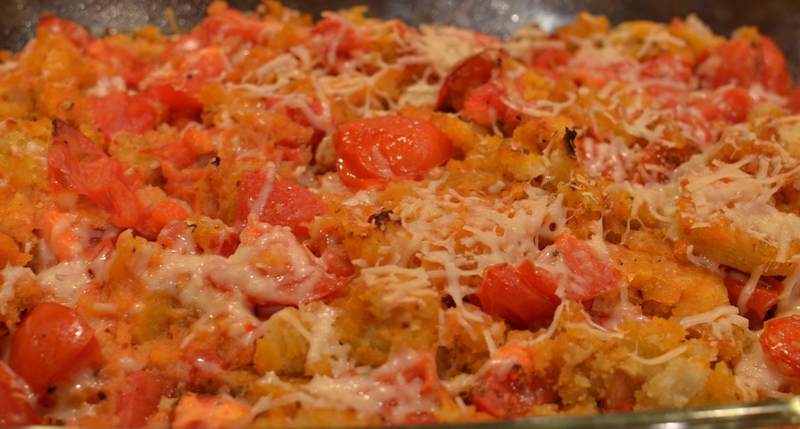 If you like tomatoes and bread and cheese then I think you will love this recipe. I want some now!